This site is my private site, and I do it for fun. It is not commercial. I am not selling anything. I make no money from this site; as a matter of fact, between hosting fees, software, and money spent on supplies and books, I spend several hundreds of dollars (and may hundreds of hours) a year on this thing. It is also not authoritative. There are people out there who know more about pysankarstvo than I do, but probably not very many. There are also people out there who know a lot more about Ukrainian history, ethnography and traditions than I do, and there are quite a few of them. If you find mistakes on this site....and I know they are there, both factual and typographical......let me know, and I will correct them. Most of the material is mine, both the writing and photography. Much of the rest is public domain (from sources like Wikipedia* and Wikimedia Commons). Some material used here has been placed on the site with the permission of the copyright holder. Some items, though, are from old folders of data whose origins I have lost track of, or whose copyright I could never determine. If I inadvertently use your photos or illustrations without giving you appropriate credit, I will either take them down, or give you credit, as you choose. Contact me via the button below. This site is meant to share my love of pysankarstvo with others. When I began it, all I had was a bunch of photos of pysanky, a bit of knowledge I’d gleaned through the years, and very basic web software from Apple. I was allowed three lines of text per page, and the ability to post photos with descriptions. I could also create “Index” pages to create pointers to my photo pages, and could create pages with a small amount of text. That was about it. Since then, oh! the changes I have seen. I now can post gigabytes of photos, text, movies, pretty much anything I want. The Apple software is now a great form of WYSIWYG which allows me to do a lot with my pages. And I have read......and learned.....a lot about both pysanky and photography. I have met many pysankary, from all over the world, and learned about different techniques and approaches to the art. .......Sadly, Apple is no longer updating or supporting the iWeb software, which is still head and shoulders above anything else out there for the non-professional. I’m keeping an old computer around to make sure i can keep working on this site; meanwhile, the software still seems to work on the most recent OS. 1.It is my site, and reflects my views. If you are a Rusyn nationalist and disagree with my interpretation of the Lemko culture, I am willing to read what you have to say, but do not feel the need to change what I have on my site. Feel free to create your own website and express your views there. 2.I am not available to do your homework. If you have general questions, I can point you to sources of information to help you write your paper, including books, other sites, and pages on my site. I will not, however, write a paper for you on the origins of the Berehynia in Ukrainian ethnography. 3.I don’t sell pysanky. There are many people who do, and who would be happy to sell you some. Check eBay, Etsy, Google and my page with links to personal commercial sites. If you are searching for a particular sort of pysanka, I may be able to point you in the right direction. 4.I don’t sell pysanka supplies. That’s Luba Perchyshyn of the Ukrainian Gift Shop in Minneapolis. You can order her dyes, styluses, waxes, etc. through the shop’s web site here. Have a wander through the site, and let me know what you think. If you find errors or typos, please let me know, so I can correct them. * If you find startling similarities here to material on WIkipedia, it is not always because I am stealing from Wikipedia. 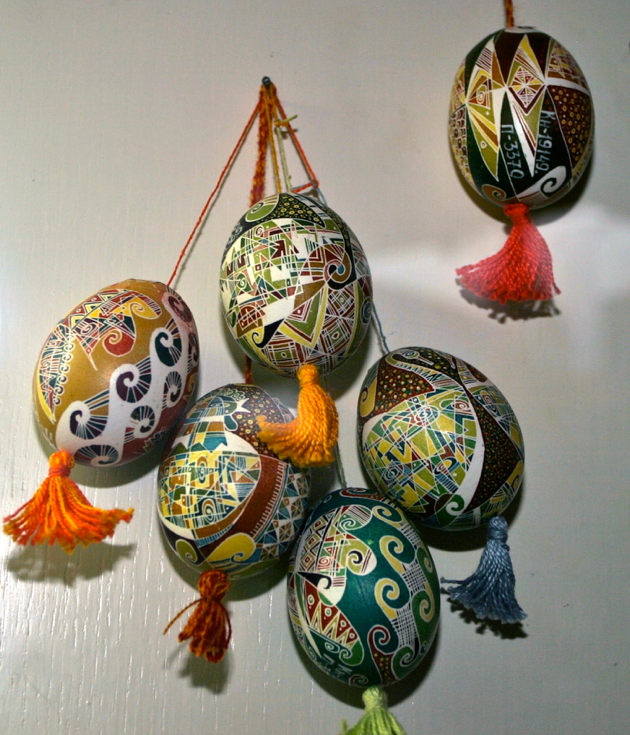 I am an editor there, and have written or contributed to several articles having to do with pysanky and Slavic egg decoration.